Order your Diezel V4 2 Channel Overdrive and Preamp Pedal from AMS and enjoy 0% Interest Payment Plans, Free Shipping, Free Extended Warranty & 45 Day Money Back Guarantee. 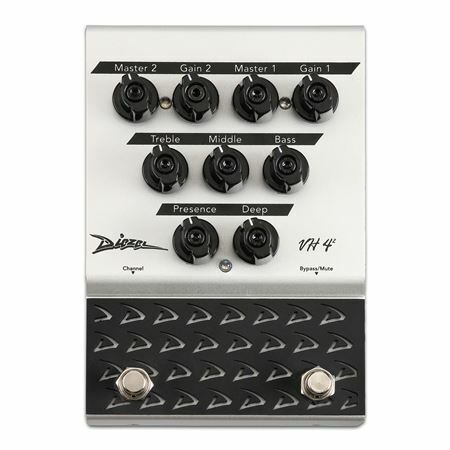 Some of the biggest names in rock and metal, including James Hetfield (Metallica), Adam Jones (Tool), and Neal Schon (Journey), have found their signature tones in the legendary third channel of the Diezel VH4 head. With the VH4-2 preamp/overdrive pedal, Peter Diezel went to great lengths to faithfully reproduce that exact same tone and feel, allowing you to place it snugly on your pedalboard. But he didn’t stop there. This pedal’s two footswitchable channels - carefully voiced for rhythm and lead tones - as well as its ability to run in front of a clean amp or directly into a power amplifier effortlessly turn any clean amp tone into a massively versatile high-gain monster. The Diezel VH4-2 preamp/overdrive pedal unleashes one of the most important high-gain tones in history with the tap of your toe. The VH4’s multiple effects loops, MIDI capabilities, and four channels made it one of the most versatile electric guitar amplifiers of its time. But as soon as players hit that third channel button, many stayed right there for good. The VH4-2 recreates that channel’s magical blend of aggression, clarity, and full-throated punch with the authenticity that only Peter Diezel can offer. And like all Diezel Amplification products, inside you’ll find the same commitment to top-tier craftsmanship and the only the finest-quality components. Plug in a VH4-2 and turn your amp into a raging VH4 stack. Onboard the VH4-2 you’ll find a full complement of tone-shaping controls, while the addition of a second footswitchable channel adds maximum versatility to this gain-hungry device. Channel one is the tried and true tone of the amplifier. Its tight bottom and cutting top are ideal for rock and metal rhythms. The pedal’s second channel adds a dose of gain and upper-mid content to ensure your solos are full-toned and nailed to the back wall. 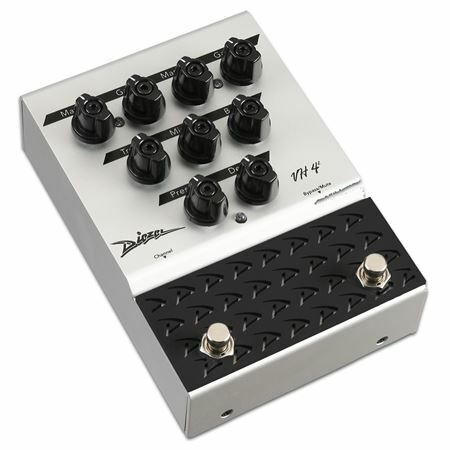 Far from just another distortion pedal, the Diezel VH4-2 offers multiple ways to achieve its ground-shaking tones. 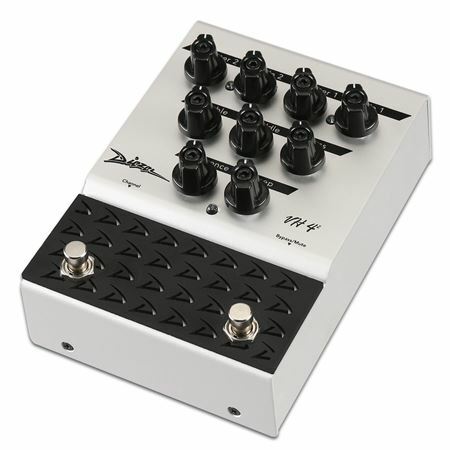 If you prefer using pedals for your dirt, you’ll find the VH4-2 works beautifully straight into the front of your amp. 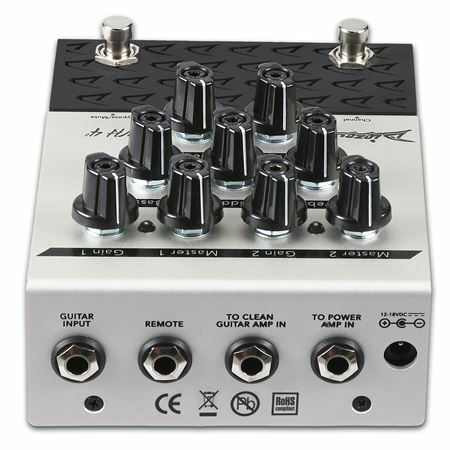 But peak around back of the pedal and you’d find a dedicated “To Power Amp In” output jack that turns the pedal into a fully functional preamp. Plug it into the series effects loop return of any guitar amp, and you’ve effectively turned the amp into your very own Diezel VH4 - perfect for players who often have to rely on less-than-dependable rental backlines. Or run it directly into a power amp and cabinet for a more compact rig with a decidedly non-compact tone.